After a meeting in town, I walked home by the cliff path. The meeting had gone well and the sun was shining so I felt chipper. Scrambling on the 5 to 10 metre-high cliffs was irresistible and lots of fun. Now in my mid-sixties, I felt privileged to be enjoying fluid movement on questionable rock under an autumn sun. The scrambling stopped for a brief moment as I asked myself whether this kind of joyful childishness should be a privilege. Why can’t every sexagenarian enjoy physical idiocy? The potential handicaps are as likely to be mental as physical. Responsible types might never dream of playing out in their old-age. I don’t mean fear of heights. Rather, it just wouldn’t occur to them. Some possibly might sneer, but all of the dog walkers I had met before leaving the path had been cheerful so I doubt that. Others may be incapable because of ill-health. In some, sad cases the restriction on movement may be completely unavoidable. Being physical isn’t the only way to enjoy retirement. I hope this group of my peers has found what works for them. Modern, chronic health problems will, of course, be hitting hard for many pensioners. A lifetime of working on the development of a multi-factorial illness will have begun limiting what individuals can do before before a work-place pension kicks in. By the time that first pension payout reaches the bank account, the end could be in sight. Please don’t travel that route. Look after yourself because reaching retirement with a reasonable degree of fitness and health is bloody brilliant. I cannot recommend it highly enough. Walks have been walked but not described here, on this blog, which is naughty because walks of such excellence need sharing. 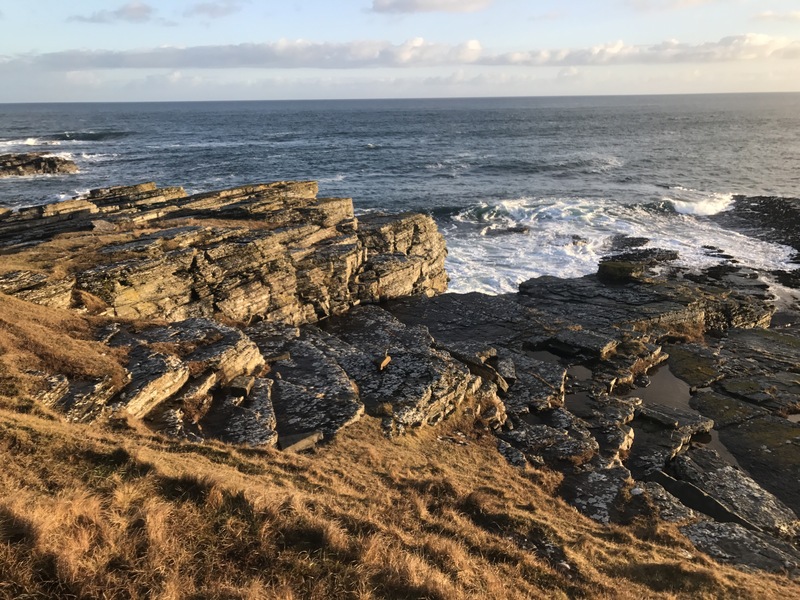 Caithness might be anticlimactic for North Coast 500 drivers who just want to turn the corner at John o’Groats, but there is plenty to see for anyone prepared to leave the trade route. It’s gorgeously wild. Underfoot conditions are taxing. The best places have no paths, just many square miles of tussocky grass, heather and bog. Good wild pitches are few and far between. Inevitably, when found, they turn out to be scenic. The coastal cliffs are spectacular and the small mountains inland have far-reaching views because of the way they rise out of a low-lying bog. I could see the Cairngorms, Orkney and Assynt from more than one of the hills. The views justify the collar work. Retirement was wonderful for my feet. Almost immediately, my plantar fasciitis eased off. Clearly, standing up all day may have helped my fitness but only at the expense of my plates of meat. Plantar returns if I walk on hard surfaces or wear boots. Wearing boots for the 2km to the station is a guarantee of a dose of pain in my heels. But bashing through trackless, knee-high vegetation is as good as a massage, particularly in trekking shoes. In boots, my toes seem to scrabble for purchase against the unyielding insole. In flexible shoes, such as those from Inov-8 or Altra, my toes get to push against the ground and that seems to make all the difference. My feet may be working harder in flexible shoes but the wasted efforts made by my toes in rigid footwear is far more destructive. At this point, I should say YMMV or, even, HYOH. I cannot guarantee that a change of footwear will solve the plantar fasciitis issue for other hikers, but it might. I’m not completely free of pain even if I can put in 11 hour days on rough ground so your thoughts on easing the problem would be welcomed. Between Dunbeath and Kildonan lies a vast area of rough ground. The map’s lack of paths promises a fair helping of collarwork but the traverse is worth the effort. Geology, conglomerates and quartzite over sandstone, creates hills which rise above a low, boggy floor with nothing to block views. I could see from the Cairngorms to Assynt and from the Moray Firth to the North Atlantic. The views emphasised the remoteness of the hills I climbed. Morven’s summit is 10 taxing miles from the train home. You might see day walkers who have driven to Braemore. Descend the west flank of Morven, however, and you are on your own. Public transport can be a bit iffy in the Northern Highlands. Stagecoach haven’t always run the buses their timetable says they will run and my journey home was entertaining. On the last day of April, the bus did what it was supposed to do, dropping me at Dunbeath for a gentle six mile stroll along the lane to Braemore. This is one road I was able to enjoy. Delightful weather and long, moorland views. The bridge at 0862096 exists and could have shortened my route to Scaraben, with some fence crossing. I preferred to walk on to the end of the road for the stone bridge over the Berriedale Water. Braemore is pretty and there is a stile giving access to the open hillside, which was very wet till it steepened for the final push to the ridge. Much of Scotland was visible from East Scaraben. I made the mistake of continuing with just a short sleeved base layer under my windproof for the walk to the main summit and was very cold because of the wind by the time I reached the shelter around Scaraben’s trig point. I continued after food and dressing properly. During the descent from Scaraben’s third, 608 summit, weariness and a realization that the vegetation was unsuitable for camping set in. Scanning the slopes of Smean, I spotted two green patches in amongst the brown mix of heather and tussocky grass. One was clearly too sloping and the vivid green of the other, smaller patch could have meant wet Sphagnum. I investigated and found a water source and a pleasant lawn. Home for the night. A heavy dew settled during the night and froze before dawn. The early sun dried my Duomid while I breakfasted but the day was dulled by overcast before I set out for Maiden Pap. Conglomerate buttresses make the hill look difficult from a distance. It isn’t. Smean’s summit gave an easy scramble. Then it was time for the steep, 400 metre ascent of Morven. A path simplifies the ascent through heather and boulder scree. My many mentions of long views might be getting tedious but the terrain creates them. St John’s Head on Orkney stood out. Foinaven and some hills, probably the Dearg group near Ullapool, we’re visible through the haze. To the south, things were murkier as the bad weather forecast by London-based weather people edged a little closer. As the cold wind was no longer being countered by sunshine, I decided to head over Cnoc an Eireannaich and down the Kildonan Burn to the train. Looking back, Morven’s conglomerate, stood out from the rounder, quartzite hills I had climbed. The ridge from Small Mount westward gave the easiest walking surface since leaving the road the day before. The map gives Cnoc an Eireannaich a height of 517 (518). Arrival at the summit showed a cairn which was higher than the trig point. The wind was so strong, the phone vibrated as I tried to photograph the map height’s explanation. I was amazed the shot came out and amazed again a minute later when I put up a bird of prey. “That’s big,” was my first thought. I spent the next 10 minutes persuading myself that I hadn’t got close to a golden eagle but a sighting of a buzzard, with white, wrist patches, later, when I was down in Kildonan gave a definitive answer. The buzzard was much more slender than the bird I disturbed. So, it was an eagle. The Kildonan Burn was enjoyable initially but then palled as I passed several dead deer, quite a few in a sheepfold at 933254. Long streamers of algae made the water look non-potable, a shame as I was dehydrated. A side stream was cleaner so I stopped for a brew. Reinvigorated, I pressed on down to the Field of Gold. Just before the gold workings is a steep sided gorge, with gorse handily placed to catch anyone who tumbles from the airy sheep tracks. At the station, lights came on shortly before the train was due, which seemed a promising sign. Nothing happened for several minutes. Then, an engineering train came from the wrong direction and stopped to tell me, the only passenger waiting, that the passenger train was running 50 minutes late. A motor had broken so the train had returned to Inverness for a replacement unit. Keeping me informed was a nice touch and the train did eventually get me home. ViewRanger is a big, complicated app which links to a confusing website. Luckily, the mapping provides plenty of value on its own. There is no need to take any notice of all the social media nonsense. So, no mention of POIs and geocaching here. Instead, I’m using ViewRanger to provide authoritative measurements of the distance I ran while assessing two other apps and two devices. ViewRanger’s endless 1:25,000 scrolling is brilliant for route planning and, in the field, the app is also useful for detail, such as putting names to coastal rock features. I must look out for the Scholl next time I’m aiming for Noss Head. Withings Go relies on accelerometers and is claiming that today’s run was 3.2 km (2 miles) further than ViewRanger states. However, ViewRanger explains what GPS readings it has recorded – 387 in 10.5 km, which is one every 27 metres – and so it’s distance is far more likely to be reliable (albeit an underestimate as I wasn’t running in straight lines). For the record, these are the distances claimed by each of the apps for today’s cross country run. The Withings Go’s accelerometers can distinguish between a fast walk and a slow run but appear unable to cope with a stride shortened by tussocks and bogs, hence the inaccuracy of the Withings app. Note that ViewRanger has imported the heart rate and paces from Apple Health. Health says I took 12223 paces during my run whereas the Withings app has only recorded 12112 paces so far today. It seems wrist accelerometers and accelerometers in a chest pocket record movements differently. In a year’s time, I will be able to claim to have been enjoying activities in the great outdoors for half a century. Although I am no longer a member of Walton Chasers Orienteering Club, my navigational skills have reached such a high level that the idea of needing a GPS is silly. I just don’t. So, a GPS is unnecessary but one thing has driven me to purchasing maps for the ViewRanger app – I bloody hate counting contour lines. Having distance travelled and ascent undertaken sorted out for me is a delight. Other apps offer other metrics. An inexpensive Withings Go pedometer counts my paces and the time spent swimming. It also offers a rough assessment of my sleep via a fairly good app. A cheap but limited Wahoo heart rate monitor helps me stick to an 80/20 running regime. In theory, at least, 80% of my running is at an easy pace with rest being quite a bit quicker. The aim is to include both quantity and quality for maximum progress. Wahoo’s app for displaying data from the heart rate monitor is pretty basic so the iSmoothRun app also helps track my workouts. Some of these apps are able to use weight readings from a Lumsing electronic scale, which I found on Amazon for a third of its usual price. The apps use the latest weight measurement to guess at the number of Calories burnt during exercise. The calculated value is one I only take seriously if it justifies a pig out. The Lumsing’s display shows weight. To discover percentage body fat the iWellness app is needed. I thoroughly dislike this app. You get what you pay for. ViewRanger has proved expensive because I gave in to the temptation to buy 1:25,000 maps for the whole country. Regrets – none at all because I love maps and ViewRanger is fairly usable. The pedometer, heart rate monitor and weighing scale, by contrast, were relatively cheap and are OK rather than good. Good enough? For me, yes, although there are features I miss. I am going to compare these devices and apps in the hope that you will gain sufficient information to be able to decide whether the cut price approach, in general, and these items, in particular, are of any use for the things you do. A daft number of screen shots will be needed, which is a good reason for splitting this review into parts. Volunteers are constructing a trail along the coast from Inverness to John o’Groats. 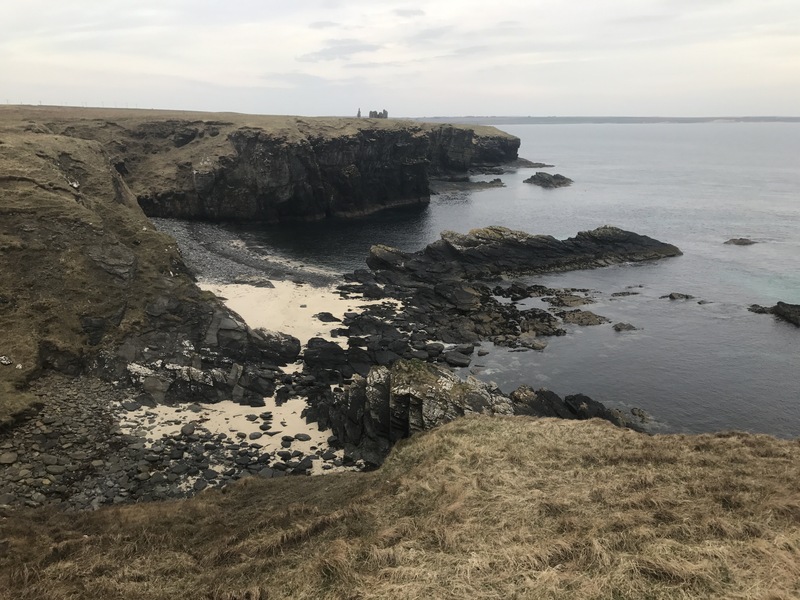 The Trail will allow End to End hikers to avoid road walking in Caithness as well as opening up spectacular scenery to those of us with lesser ambitions. The Trail is not a path. Where landowners have given permission, stiles are being built but the underfoot conditions offer slow going. Tussocky vegetation and cows with calves in summer mean that the Trail is best undertaken in early Spring. March, when days start to lengthen, might be best. 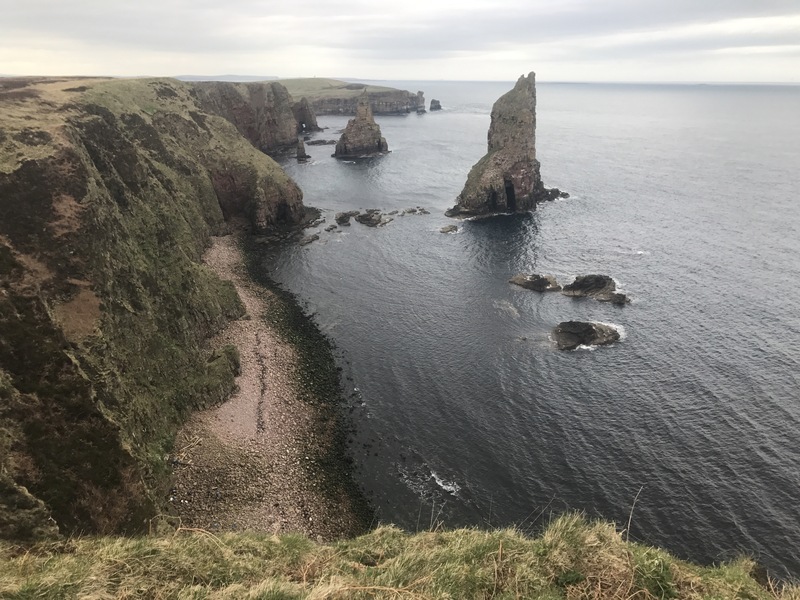 Last weekend, I hiked the final two stages, from John o’Groats back to Wick, thoroughly enjoying myself in the process. My first wildcamp of the year also took place. John o’Groats was much nicer than I remembered and surprisingly busy for April. Several other groups were hiking towards Duncansby Head and, at the Bay of Sannick, a man was flying a drone. He was photographing a seal from a respectful distance but the seal was fascinated by the drone and craned its neck for a better view. Once past the Stacks, I left other walkers behind and headed along a path through heather over the Hill of Crogodale to Skirza. A road up from the quarry at Skippie Geo offered an alternative to the Trail. I’m not entirely convinced that my conscientious line to Thistly Hill was rewarded. 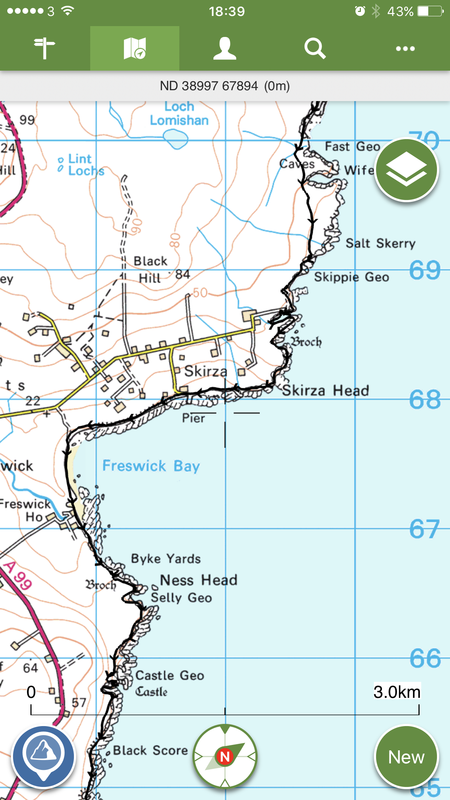 To be honest, the Haven of Skirza was a bit of a let down. The lovely sands of Freswick Bay soon restored my spirits. Then the scramble by the mill at Freswick Mains gave a fun introduction to the next stretch of cliff, which has more than it’s fair share of ruined castles and brochs. It’s not a stretch to rush, which is a good job, because you can’t. Even in Spring, the vegetation makes walking a slow process. 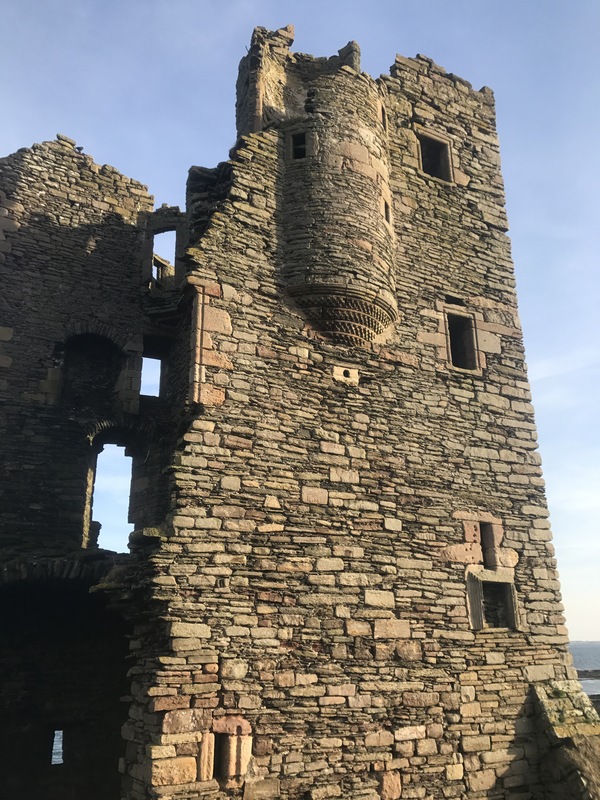 In fact, at Bucholly Castle, I was quite tired and gave some thought to pitching. Just 9 miles in, I couldn’t bring myself to stop. As the best pitches were not quite flat, not quite dry and not quite out of sight, pressing on was the best option. A pork pie and a cinnamon bagel gave me the energy to continue. After a messy corner next to a pig farm, the Trail eased and was very pleasant in front of the houses at Auckengill. This harbour, unlike Skirza’s, is a visual treat and, fanfare, there is a short path along to the Mervyn Tower monument and broch. More slow going near the quiet, main road led to the spectacular, cliff top ruins of Keiss Castle. After two more brochs, I reached Keiss harbour, with its big, stone breakwaters and pretty, little boats. The old warehouse appears to be flats now. I didn’t look closely. Instead, I climbed the stairs up to the village green and made a complete hash of finding the path back to the beach. As my route was dreadful, I won’t describe it. My excuse for the error was concern about the River of Wester. Tide out – it’s ankle deep. Tide in – chest deep. The tide had turned so, once on firm sand, I motored along Sinclair Bay. The bay is spectacular and popular. Walkers could be seen in small groups right along the 3 miles of sand. I hurried past all of them and paddled straight through the river without needing to roll up my trousers. Wick golf course looks a dream campsite and the clubhouse was closed but I had a sweeter, wilder pitch in mind so on I went. Through a field with sheep that followed me, by two camper vans at the end of a long, dirt track, past the very posh Ackergill Tower and into Ackergillshore via a children’s playground. The light was fading fast as I finally pitched on perfect turf above the silver sand of a bay popular with eiders. ViewRanger claimed my 32km jaunt had included 1400 metres of climbing even though the Trail had never taken me above 80 metres. I slept well. Next morning, my early start was rewarded with birdsong, notably from larks on land and eiders off shore. A short walk brought me to Girnigoe Castle and the best bit of the walk, around Noss Head. Numerous black guillemots added their squeaky whistle to the continuing bird chorus. Beyond the lighthouse, with all of the last stretch in view, I stopped for a second breakfast. While I enjoyed my final mini pie and bagel, a fishing boat clanked close by as a crab pot was lifted. The alarm calls of oystercatchers and herring gulls around me suggested the birds here are more familiar with fishermen than with walkers. I hope the John o’Groats Trail encourages more walkers to enjoy this glorious coastline. My weekend hike was over but I’m giving serious thought to doing the entire Trail next year because the bits I’ve seen are excellent. The Trail has its own website and WalkHighlands also has a complete description of the route. However, the most inspirational resource I’ve found is the Facebook page of Gavin Paul Bird. 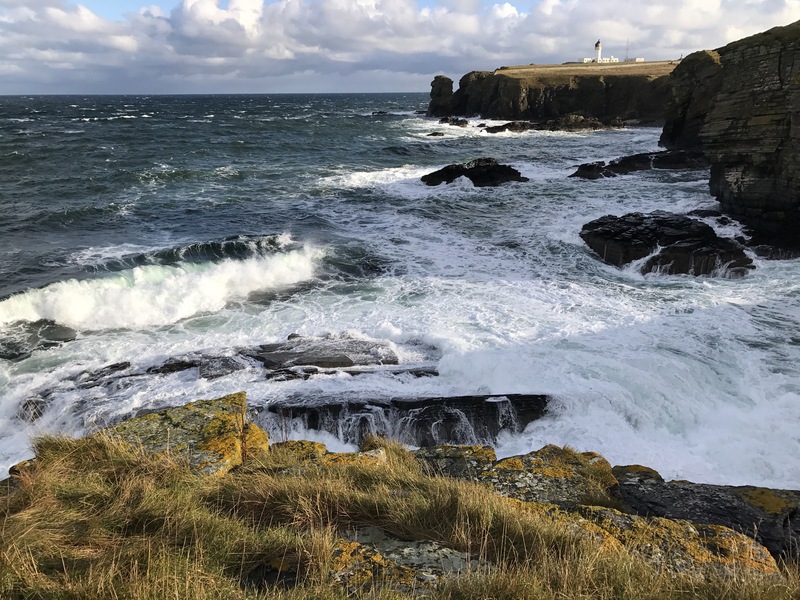 His Caithness Images, with drone footage of the Trail, are utterly seductive. Apart from enjoying a lovely morning, the aim of today’s hike was to find out how well an iPhone 7 Plus and a Gorillapod work together as a video filming set up for backpacking. Sadly, I can’t show you the results as this blog doesn’t accept video so you’ll have to take my word for the acceptability of the product. It’s plenty good enough for me and would look fine on YouTube. However, my interest lies in a set up for backpacking and there is a problem. Filming on a cold day absolutely demolishes the charge in the battery. Viewranger claims I was out for 2 minutes under 4 hours. Filming occupied the first 3 hours and, in that time, the battery charge dropped from 100% to 21%. For the walk home, I put the phone inside my jumper and listened to a podcast. For this leg of the walk, the charge dropped from 21% to 20%. So, for backpacking, the iPhone and Gorillapod set up would need to be used sparingly even though my Anker battery pack is pretty huge. The Gorillapod is part of the problem. It’s head is stiff and not easy to deploy. Getting the tripod out of a rucksack, attaching it to the phone and setting it up would be tedious enough to keep me from shooting video except when highly motivated. Today, I kept the iPhone locked into the Gorillapod and held the phone in my hand. The legs of the tripod lay along my forearm. This set up was convenient and very easy to use but exposed the phone (and my hand) to the cold wind. A permanently attached tripod could also be a problem if I chose to take a side trip up Suilven on my next hike. I’m hoping my next trip will take no more than 5 days between power sockets. Even so, discipline will be crucial. Using my iPhone, a Gorillapod and an Anker power pack will get me the results I want so, failing a lottery win, that’s what I’ll be taking. Using my hugely expensive new phone as a camera when near cliffs gives me the willies. The naked phone is slippery, if gorgeous, and the Apple leather case only slightly more grippy. Today, I tried using the phone inside an Aquapac case. Firstly, I found that Touch ID wouldn’t work. I also discovered that the bare phone sticks to Aquapac’s plastic but, when in the leather case, it slides in and out quite easily. During a walk, I need a phone case which helps to stop me from dropping the phone at all, let alone over cliffs. Aquapac’s lanyard does exactly that. I had the phone in my top pocket with the lanyard round my neck. The lanyard was unnoticeable during my 4 hour walk. Obviously, I’d be wary of putting the lanyard round my neck in a situation where it might catch but today’s walk was an easy one. The last question concerns photos. Can a decent shot be taken through the plastic case? 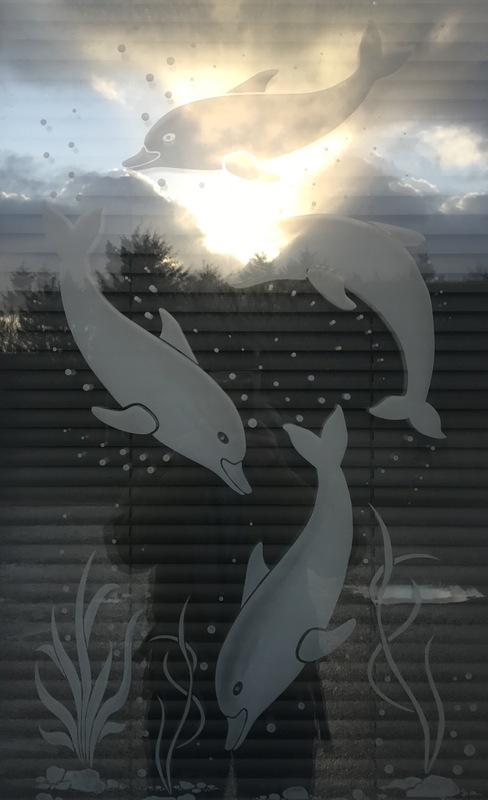 Here is some silica-based evidence – sunlight rocks and a cropped photo of an engraved door panel. Not too bad, I think. 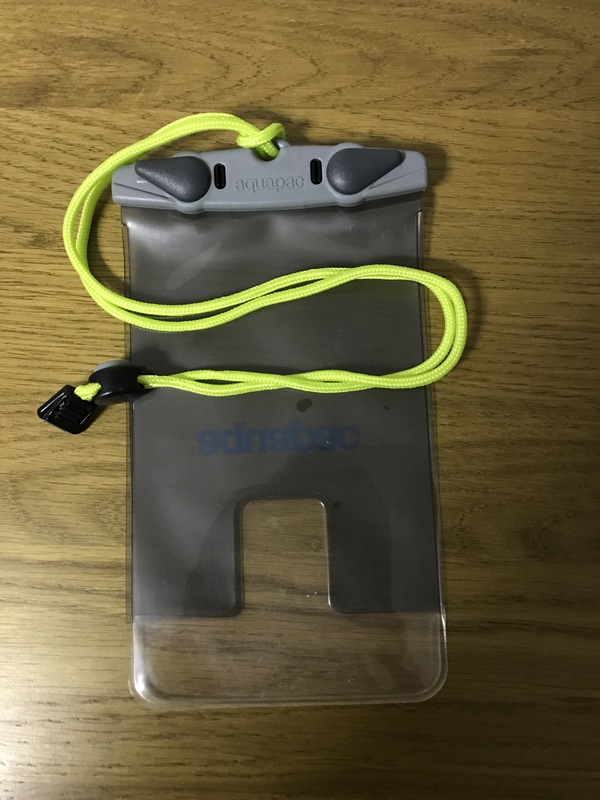 My thanks go to Ian Sommerville at Daunerin’ Aboot for advising me to try the Aquapac case. Sadly, in this day and age, I have to mention that I paid for the case with my own money. No one never gives me nowt! Two powerful hikers who eat more interestingly than most when backpacking are Aria Zoner and Liz Thomas. Both have mentioned kale crisps as a source of veggies for wild camps. I like kale and miss green vegetables when walking from one remote pitch to the next so I decided to give kale crisps a try. The recipe is really simple but I’m not going to provide it here. After eating half of my test batch, I experienced nasty, sulphurous belching. I dread to think what the farts are going to be like. A recipe strictly for wilderness walks, I think.